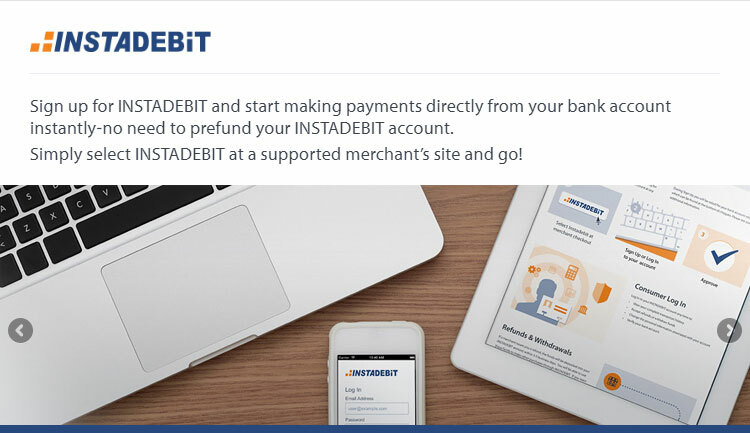 InstaDebit is a secure payment option similar to iDebit that allows you to transfer payments directly from your bank to account to a merchant or casino. Transactions are made instantly, hence the name InstaDebit. There are several advantages for Canadians in playing at InstaDebit online casinos. Instantaneous: For a start, you don’t have to establish and wait for approval before you make a deposit into your casino account. If you want to use InstaDebit provided you have an account at a Canadian bank you can set up an account immediately via the banking page of any casino that accepts it as a payment method. This is because you receive a temporary transaction limit as soon as you create your InstaDebit account, which is then further increased once you verify your bank account. 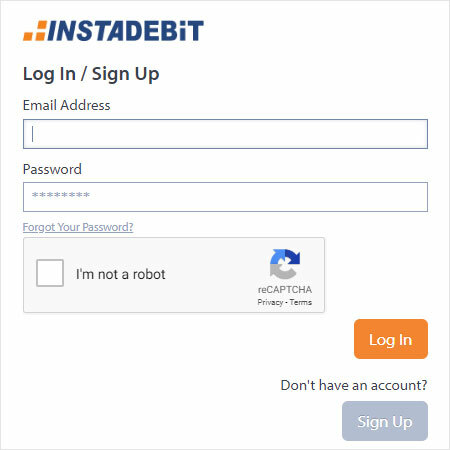 Widely Accepted: InstaDebit is supported by all Canadian financial institutions, and there is the added advantage that casino transactions do not appear on your bank statements – instead, they show up as INSTADEBIT.com or 1-877-88DEBIT. You can also make payments in both CAD$ and USD$. Security: Playing at a top instadebit casino is very secure. Your financial details are shared only with InstaDebit, and not the online casino or any other merchant where you choose to use it. 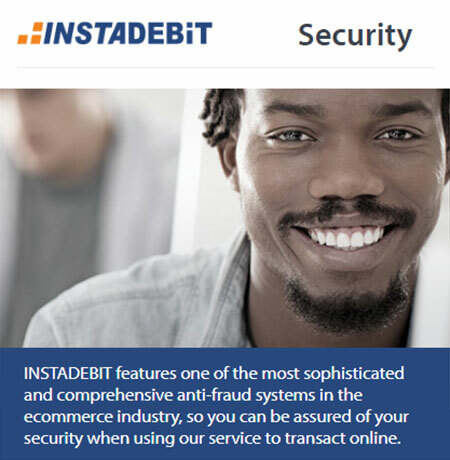 This means you’re at significantly less risk of having your personal information or identity stolen or hacked, as InstaDebit employs state-of-the-art online security, with all transactions transmitted securely using 128-bit encryption technology. Industry-leading online security certification companies VeriSign and TRUSTe also monitor and regulate Insadebit’s operations. Less Admin: There is less administration required on your part when using InstaDebit when compared to e-wallets such as Skrill and other casino depositing methods. As it operates like a cheque account with funds being drawn directly from your bank, it’s not necessary to keep your InstaDebit account topped up as you do with an e-wallet such as PayPal. Similarly, you don’t have to go through the process of making a transfer from your bank to your e-wallet. This means you can deposit and play whenever you want to. Should you have any issues 24/7 customer support is always available, via live chat, email or phone. Preferred Payment Bonus: You will also find that a number of the online casinos that we recommend, such as casino.com, offer deposit match bonuses (usually up to 10%) for using InstaDebit to make an initial deposit when setting up an account. Are There Any Disadvantages to Using InstaDebit? Generally speaking, InstaDebit is a highly effective and efficient payment method. However, there are a couple of disadvantages attached to using it. When you withdraw from InstaDebit, it can take between 3–5 days before funds arrive back in your bank account. InstaDebit is also not available if you don’t have a Canadian bank account, or you don’t have sufficient documentation to establish your identity. Also, it’s only possible to register one bank account with InstaDebit, and so you can’t split payments between different accounts. Although it’s possible to set up an account via the Banking page at online casinos accepting InstaDebit, you can also do so directly via their website. Click on login/ Sign Up in the top right-hand corner. You’ll be redirected to a new page, where you’re required to enter an email address and create a password. The next step is to add your name, address, date of birth and the last 4 digits of your SIN to verify your identity (you will never be asked to reveal your full SIN). You will then be prompted to enter your 5-digit bank transit number, your 3-digit financial institution number and your 12-digit bank account number. As part of the bank verification process (in order to receive an increased transaction limit), within the next 3–5 business days, a small deposit (less than $2.00) will be made into your bank account. Once this appears, log into your InstaDebit account and click on Verify Bank Account. When prompted, enter the exact amount that you received and your revised transaction limit will be activated. Although it’s not used as universally as it once was, with newer electronic payment systems such as iDebit gaining greater prominence, as a Canadian-based payment method InstaDebit casinos still remains a significant player in the market. Being directly connected to your bank account means that fewer steps in getting your money over to a casino account, whilst the preferred payment bonus is an additional plus.